Spray 4 1/2- to 5-quart slow cooker with cooking spray. Mix corn, bell pepper, milk, melted butter, sugar and salt in slow cooker. Stir in half of the bacon. Refrigerate remaining bacon. Cover; cook on High heat setting 1 1/2 to 2 hours. Stir in cream cheese. Cook on High heat setting 10 minutes longer. Stir well; sprinkle with remaining bacon. Corn can be kept warm on Low heat setting up to 1 hour. For an extra-pretty presentation, sprinkle this dish with chopped fresh chives before serving. As this dish feeds a crowd, it goes along beautifully with a baked ham and maybe some scalloped potatoes or green bean casserole. Creamed corn is borrowed from Native American cuisine. It was made by cooking the kernels together with the milky liquid gathered from scraping the corn cob. From these origins, the dish has been endlessly adapted. It remains a popular side dish in the American midwest and south. Betty’s creamed corn recipes typically call for adding some type of dairy product, from cream to cream cheese, to whole sweet kernel corn. 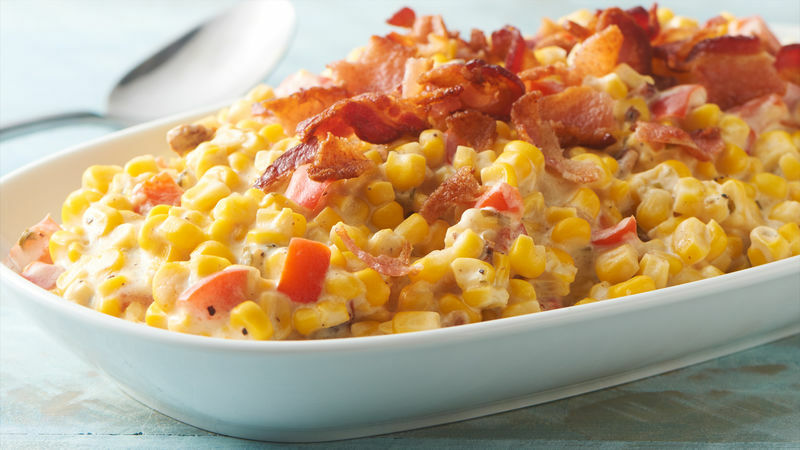 Is it sweet corn season where you live? Why not freeze some, so you can enjoy summer’s sweetness all winter long? It’s easy to do; simply husk and clean corn cobs. Then cut the kernels off the cob, and store in zip-top plastic bags in your freezer.